Are you looking for the best machine shop near you? Look no further than Cliff Industrial. 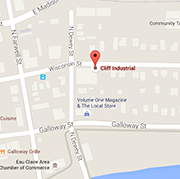 Cliff Industrial is the most trusted local machine shop in the Chippewa Valley and now we’re serving Chippewa Falls! With more than 20 years of experience, we serve clients anywhere in the country with our online resources. Simply use our website to upload your drawing files and one of our representatives will contact you with an estimate within 24 hours. We will then make arrangements for pickup and have it delivered back to your doorstep. YES, IT’S THAT EASY! OK… So we’re not exactly located in Chippewa Falls, Wisconsin… BUT… Using Speedee Delivery Service or even Delivery Fix for smaller items. Just down US-53 South, our facility is located Downtown Eau Claire, Wisconsin. Using one of these quick, inexpensive pickup and delivery services it’s just like we’re next door. Outsourcing your company’s machining needs is one of the most practical ways to reduce the overhead costs of your production. By turning to local machine shops, you get to save time and money while ensuring precision and accuracy, especially when doing repetitive drilling, cutting, and milling operations. With that said, we ask you to give us a try next time you need something built, rebuilt or repaired. Also, don’t forget to ask about our Free Pickup & Delivery options we offer. Find out more about the services we offer below or just give us a call at 715-835-8314.